The enemies of Israel and the Jewish people are now working feverishly in high gear. Among other things, they falsify, even deny, Jewish history. The fanatical hatred of our enemies goes so far as to deny that Jews were ever a nation or ever in the Land of Israel or that modern Jews have any ancestral connection with ancient Jews. One of the current denials perpetrated by Arabs who deny the Jewish history of Jerusalem is the denial of Jewish holy places and Jewish residence in various place before 1947-48, when Jews were driven out of their homes in what became Judenrein "East Jerusalem" under Arab rule. When the controversy over Jewish-owned real estate in the old Shim`on haTsadiq Quarter of Jerusalem erupted [here] in mid-summer of 2009, I visited the area and interviewed the spokesman for a group of Arabs belonging to a family, some of whom had been evicted from a house there for refusing to pay rent to the Jewish owners, the Sefardic Community Council. A group from this family were sitting outside a house where some of them had been living before being evicted. Other family members lived elsewhere in the city. This spokesman, al-Hijazi by name, as he told me, changed his story several times as I showed that I had information about the history of the site. When I said that Jews said that the Tomb of Simon the Just [Shim`on haTsadiq שמעון הצדוק ] was on the site, he claimed that Simon's tomb was really in Jish Village in the north, that is, in the Galilee. Jish Village כפר ג'יש was called in ancient times by the Hebrew name Gush Halav גוש חלב, distorted by the Arab pronunciation of Jish, with the second word, Halav, left out. The spokesman's name al-Hijazi indicates a family origin in the Hijaz, northwestern Arabia, where Mecca and Medina are located. he answered: Not true [לא נכון]!! So much for the credibility of Arab witnesses. I must say that al-Hijazi had the trimmed short beard typical of Hamas believers and most likely supported Hamas rather than Fatah. What is most outrageous is that in much or most of the media coverage of the controversy over the Shim`on haTsadiq Quarter, it is never mentioned that Simon's Tomb was a focus of Jewish pilgrimage for centuries, especially on the Lag b`Omer holiday, like the tomb of Shim`on bar Yohai in the Galilee at Meron, which attracts much much larger crowds on Lag b`Omer. 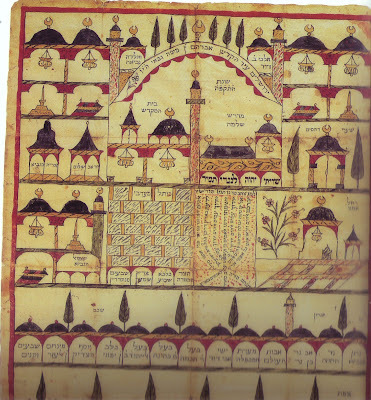 Here are three illustrated, illuminated tables of Jewish holy places in the Land of Israel that show that it was considered a Jewish holy place and a focus of pilgrimage centuries ago. These illustrated, illuminated tables were exhibited by the Israel Museum in a show in Winter-Summer 1996, two years before 1998 when Jews came back to live in some of the old Jewish homes from which Jews had been driven in December 1947 [one family stayed until the 8th to the 10th of January 1948. Their date of flight is uncertain to a surviving family member]. These tables show the long-standing Jewish reverence for this tomb. 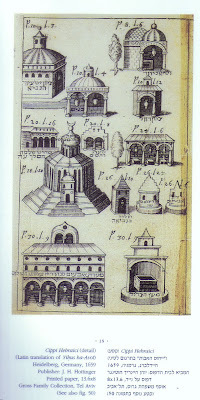 The illustration above shows the Tomb of Shim`on haTsadiq in the lower right corner. Unfortunately, the original document suffered a crease going through the letter shin [ש ] of the name Shimon [שמעון]. The picture shows the tomb or tomb marker [ ציון] inside a cave, which is correct. The table was published in 1659 [click on photo to enlarge]. In this illustration, the tomb of Shim`on haTsadiq [here the name's two parts are in reverse order: צדיק שמעון ] appears at the left middle of the table, just below the depiction of the Western Wall כותל מערבי [Wailing Wall] and between the names of the Sanhedrin tombs [here: שבעים סנהדרין ] and Kalba Savu`a [ כלבא שבוע ], a former name for what is now called the Tombs of the Kings, a Jewish holy and historical site under French government control under the name Tombeau des Rois. The location of the tomb's name on the table shows that it was in Jerusalem, along with the other sites mentioned just above and adjacent to Shim`on haTsadiq on the table. The table dates to the Hebrew year TAQPAH [ תקפ''ה ]. That is, 1824-1825 on the Gregorian calendar. 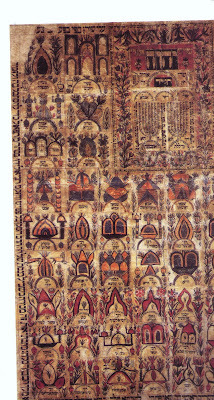 The table is drawn with watercolor and ink on paper and was made in the Land of Israel. On this table, the name Shimon haTsadiq appears on the left side on the second tier from the bottom. This table is dated to 1829-1830 [the year on the Hebrew calendar תק''ץ]. It too was produced in the Land of Israel and is watercolor and ink on paper. The attack on Jewish history in general and Jewish history in the Land of Israel in particular is common in English-speaking countries, especially Britain and the United States, it seems to me. See my post on the Financial Times out of London [here]. The FT, a pro-capitalism, pro-free market newspaper, was trying to promote the asinine and wildly dishonest book of Shlomo Sand, a Communist on the faculty of the University of Tel Aviv. Sand claims that the Jewish people was "invented" in the 19th century. Nadia Abu el-Hadj, a degree-holding "anthropologist" ["palestinian" Arab by her background] appointed to the Columbia University faculty in New York, despite many objections, denies aspects of the history of Second Temple Times [here & here]. The assault is happening now. Among other venues of attack, Arab nationalists, Islamists, anti-national Israelis, American and other Western apologists for Arab terrorism have seized on the issue of the Shimon haTsadiq neighborhood in Jerusalem. This endeavor to eliminate Jewish history is obviously an obstacle to peace.